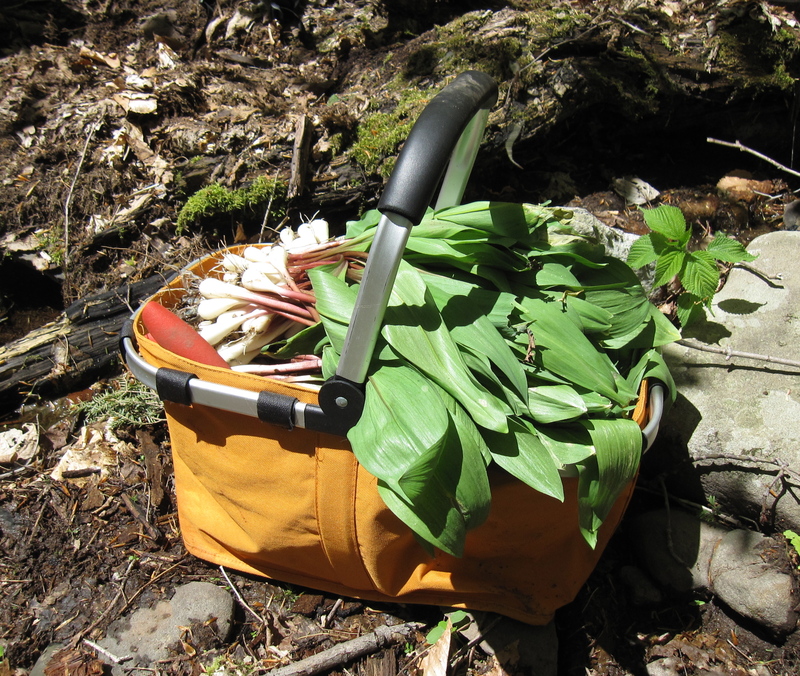 This spring we learned about a new wild vegetable – the elusive ramp. We’d been hearing about ramps and seeing the word on menus for a few weeks. Such is the fervor, in the northeast anyway, even Time magazine did a feature on them. We asked our Facebook fans to discuss ramps awhile back, and we were met with both puzzled and informed responses. So what, pray tell, is a ramp? It’s an early spring wild vegetable also known as spring onion, ramson, wild leek, wild garlic, and, in French, ail sauvage and ail des boi. That should give you a good idea about what we’re dealing with here. Ramps have a strong garlic-like odor and a definite onion flavor. In fact, speaking from experience, if you eat them and fill your car with them on the same day, the smell in your car will remind you of this experience for days afterward. Last week, our friends Luc and Nina, the chef and co-owners at a wonderful local restaurant in Woodstock, NY called ORiole9, asked us to go “ramp hunting” with them. It was a beautiful spring day, and the drive to our deep woods location was gorgeous, as are most drives in the Catskills. We parked, and jumped out to start our trek. We personally were under the impression that the ramps would be hiding in plain sight under a nearby bush, though our hosts knew better. How lucky we were to be with a chef on this hunt – as soon as we returned to the restaurant, Luc made an omelet with cheddar cheese and ramps, which he whisked to our table before we even knew he was absent. It was delicious. So, here’s the question. Are ramps popular where you live? 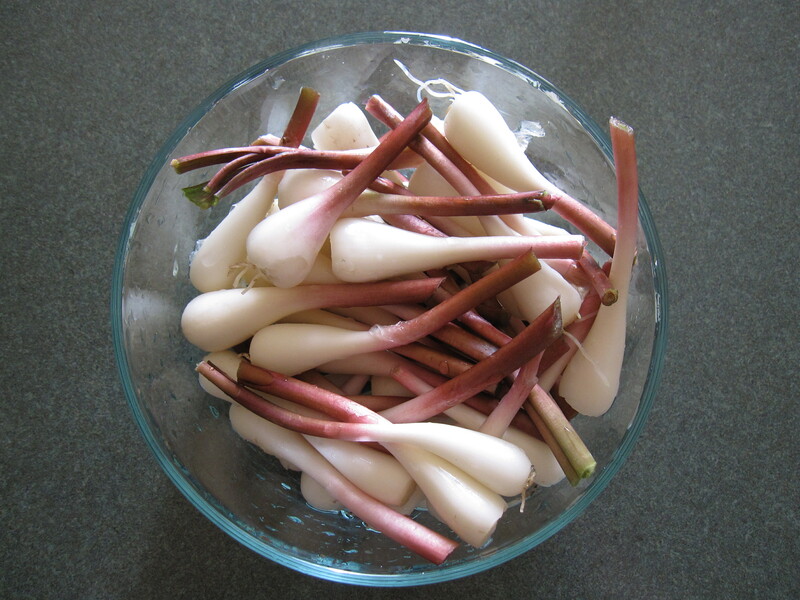 Do you have any ramp recipes to share? We’d love to hear what you have to say. MORE PHOTOS FROM THE RAMP HUNT. This entry was posted in At the source, In the kitchen, In the news, Natural health, Sustainability and tagged Catskills, chef, cooking, food, garlic, New York, Oriole9, ramps, recipes, Woodstock by Cayenne Room. Bookmark the permalink. My favorite ramp recipe so far this season was roasted potatoes, ramps and beech mushrooms. I tossed those three with olive oil, dried rosemary leaf and a splash of lemon before roasting. Super yummy! Thanks, Cynthia. That sounds great! The lemon is a perfect touch.